Journal of Low Frequency Noise, Vibration & Active Control is a peer-reviewed open access journal which focusses on creating a unified corpus of knowledge on low frequency noise, vibration and control. Please see the Aims and Scope tab for further information. Submit your manuscript today at https://mc.manuscriptcentral.com/lfn. Articles submitted before 1st October 2018 will be charged 600 USD. Articles submitted after will be charged 1,200 USD. • low frequency noise and vibration control: problems and solutions. The journal operates a conventional single-blind reviewing policy in which the reviewer’s name is always concealed from the authors. Please read the guidelines below then visit the journal’s submission site https://mc.manuscriptcentral.com/lfn to upload your manuscript. Please note that manuscripts not conforming to these guidelines may be returned. Only manuscripts of sufficient quality that meet the aims and scope of Journal of Low Frequency Noise, Vibration and Active Control will be reviewed. Remember you can log in to the submission site at any time to check on the progress of your paper through the peer review process. Journal of Low Frequency Noise, Vibration and Active Control is an open access, peer-reviewed journal. Each article accepted by peer review is made freely available online immediately upon publication, is published under a Creative Commons license and will be hosted online in perpetuity. Publication costs of the journal are covered by the collection of article processing charges which are paid by the funder, institution or author of each manuscript upon acceptance. There is no charge for submitting a paper to the journal. The article processing charge (APC) is $1,200 USD (+VAT where applicable*). Following a preliminary triage to eliminate submissions unsuitable for Journal of Low Frequency Noise, Vibration and Active Control all papers are sent out for review. The covering letter is important. To help the Editor in his preliminary evaluation, please indicate why you think the paper suitable for publication. The journal’s policy is to have manuscripts reviewed by two expert reviewers. Journal of Low Frequency Noise, Vibration and Active Control utilizes a single-blind peer review process in which the reviewer’s name and information is withheld from the author. 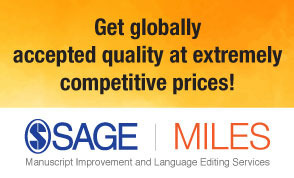 All manuscripts are reviewed as rapidly as possible, while maintaining rigor. Reviewers make comments to the author and recommendations to Editor in Chief who then makes the final decision. Journal of Low Frequency Noise, Vibration and Active Control is committed to delivering high quality, fast peer-review for your paper, and as such has partnered with Publons. Publons is a third party service that seeks to track, verify and give credit for peer review. Reviewers for [Journal] can opt in to Publons in order to claim their reviews or have them automatically verified and added to their reviewer profile. Reviewers claiming credit for their review will be associated with the relevant journal, but the article name, reviewer’s decision and the content of their review is not published on the site. For more information visit the Publons website. Journal of Low Frequency Noise, Vibration and Active Control requires all authors to acknowledge their funding in a consistent fashion under a separate heading. Please visit the Funding Acknowledgements page on the SAGE Journal Author Gateway to confirm the format of the acknowledgment text in the event of funding, or state that: This research received no specific grant from any funding agency in the public, commercial, or not-for-profit sectors. It is the policy of Journal of Low Frequency Noise, Vibration and Active Control to require a declaration of conflicting interests from all authors enabling a statement to be carried within the paginated pages of all published articles. Journal of Low Frequency Noise, Vibration and Active Control and SAGE take issues of copyright infringement, plagiarism or other breaches of best practice in publication very seriously. We seek to protect the rights of our authors and we always investigate claims of plagiarism or misuse of published articles. Equally, we seek to protect the reputation of the journal against malpractice. Submitted articles may be checked with duplication-checking software. Where an article, for example, is found to have plagiarized other work or included third-party copyright material without permission or with insufficient acknowledgement, or where the authorship of the article is contested, we reserve the right to take action including, but not limited to: publishing an erratum or corrigendum (correction); retracting the article; taking up the matter with the head of department or dean of the author's institution and/or relevant academic bodies or societies; or taking appropriate legal action. Before publication SAGE requires the author as the rights holder to sign a Journal Contributor’s Publishing Agreement. Journal of Low Frequency Noise, Vibration and Active Control publishes manuscripts under Creative Commons licenses. The standard license for the journal is Creative Commons by Attribution Non-Commercial (CC BY-NC), which allows others to re-use the work without permission as long as the work is properly referenced and the use is non-commercial. For more information, you are advised to visit SAGE's OA licenses page. Journal of Low Frequency Noise, Vibration and Active Control adheres to the SAGE Vancouver reference style. Please review the guidelines on SAGE Vancouver to ensure your manuscript conforms to this reference style. Journal of Low Frequency Noise, Vibration and Active Control is hosted on SAGE Track, a web based online submission and peer review system powered by ScholarOne™ Manuscripts. Visit https://mc.manuscriptcentral.com/lfn to login and submit your article online.